what might be the deadliest bio-weapon the universe has ever seen. What is this deadly object? Well, Deadpool's employer is being a little vague about that. Let's just say when the secret is finally revealed, it's enough to throw even the Merc with two Mouths for a loop...Oh hell, we can't keep a secret, it's the severed-but-still-hungry head of the Marvel Zombies Deadpool! 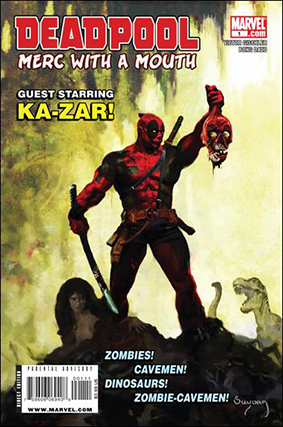 To save the universe, Deadpool must team up with himself to dodge Hydra operatives, dinosaurs, cavemen and zombie cavemen as he attempts to take his not-so-precious cargo back where it came from: the Marvel Zombies Universe. Plus, a bonus reprinting of the first apperanace of Deadpool from New Mutants #98! Written by VICTOR GISCHLER. Art by BONG DAZO. Cover art by Arthur Suydam.